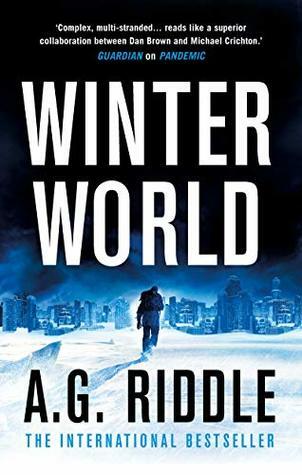 Having read and thoroughly enjoyed A.G. Riddle’s Pandemic series, I couldn’t wait to read his latest, Winter World. Not only do I love the visceral thrill of eschatological narratives and their exploration of geo-political machinations as well as emotional and psychological trauma and challenges of facing the end of the world as we know it and how people react, but the notion of the earth becoming a winter wasteland (and the reasons behind this) were fascinating to me – very Day After Tomorrow-esque. This tale of the earth’s rapid change from varied climate and where power is concentrated in familiar regions to one where mass immigration from First World centres to formerly third world countries is told from two points of view. The first is that of an astronaut/scientist and commander, Emma, and a brilliant doctor and roboticist (among other things) James, who commences the book in a federal prison. The way Riddle tells the story of earth’s epic struggle to survive an attack that will destroy all life is at once personalized through these two characters and the relationships they form with their families, colleagues and each other, but also far-reaching. He cleverly keeps the pace moving by leaping the story forward and avoiding what some sci-fi narratives do (albeit some do it very well), bogging the reader down in extraneous scientific detail that show the author’s grasp of technical complexities as opposed to serving the story. We are given some of the science and for this Luddite, it appears to work. But it is the story that captures you – as well as demands you suspend your disbelief – as James and Emma and the brilliant people they work with fight to battle an alien enemy no-one predicted and who is ruthless in the extreme. My only mild reservations are that James and Emma are so damn courageous and amazing. James is like the nerd’s James Bond personified but with the ability to grow and change – for the better (even when he’s practically perfect in every way). Emma, through great tragedy and personal hardship is also a geek Mary Poppins – intelligent, focused, self-sacrificing and lovely. I just wish there were more people Iike Emma and James in real life. As it is, I’ll have to wait for the sequel to find out where their battle and the dangerous adventures that ensue lead. Looking forward to it! Mosaic, by Michael C. Grumley. 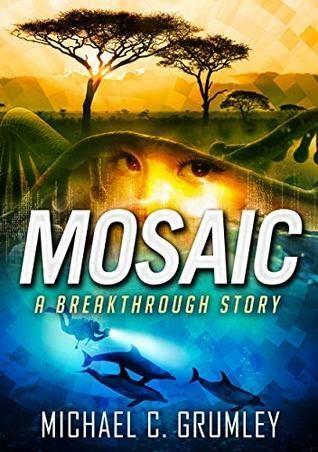 Mosaic is the fifth book in Michael C Grumley’s fabulous Breakthrough series, a tale that keeps getting wilder, more intense and utterly immersive with each book. Grumley’s imagination, grounded in science, knows no bounds but also respects them as his tale of a group of ex-Navy seals, scientists, ethical politicians (yes, they exist in Grumley’s world) as power-hungry despots, conspirators and unscrupulous folk well as dolphins, primates and an assortment of others, gets taken to the next level. Having rescued the young Chinese woman, Li Na Wei, John Clay and Steve Cesare as well as Alison and Neely cannot rest on their laurels. While international interest in not only the bacterium they’ve discovered and its implications for Earth’s future but where it’s come from intensifies, it’s the attention they’ve attracted from their own that poses the greatest threat to their mission. Once again, the wide cast of characters are expanded upon revealing their strengths and vulnerabilities. Readers who have invested in this series need to be prepared to lose a few favourites as well for surprises. Just when you think you know where the narrative might be heading, it explodes in a different direction. Some old faces and new also make appearances and then, of course, there’s the endearing mammals – Dirk, Sally, the dolphin Elders, the gorgeous primates – all of whom have secrets to tell and wonders to share with their human companions. It’s so evident that Grumley really cares about this story and those he’s created to help him tell it – you cannot help but care as well and forgive the narrative if it sometimes slips or slides into over-telling or didactics (which he mostly avoids). I was describing this series to a friend and while I don’t think this does it justice, it’s sort of Avatar meets Indiana Jones, meets James Bond meets Dr Doolittle. I am just astonished that a major publisher or production company hasn’t picked them up. James Cameron? Where are you? Grumley’s series is waiting for your treatment. My only disappointment is that I have to wait so long for the next book. It’s hard to describe the Breakthrough series by Michael C Grumley without resorting to superlatives and a bit of hyperbole. It is original, well-written, with characters you care for, a cracker of a plot and, yes, while it does ask you to suspend your disbelief and maybe play with science, hell, it’s fiction – a terrific action-packed, techno-thriller series with an emotional environmental, animal and human heart. 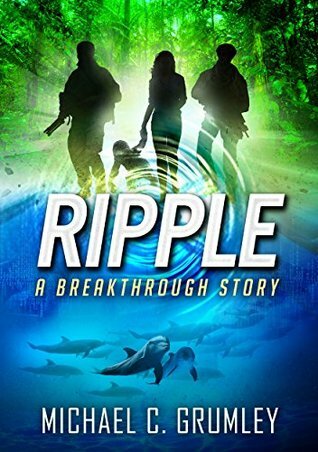 Ripple, as the latest book in the series (thank goodness Grumley is working on a fifth), simply adds to this incredible tale of Alison Shaw, John Clay, Steve Cesare and the team (including the dolphins and primates) and their support network that seek to prevent sinister forces from discovering and using an alien creation to wield power and control over the earth. 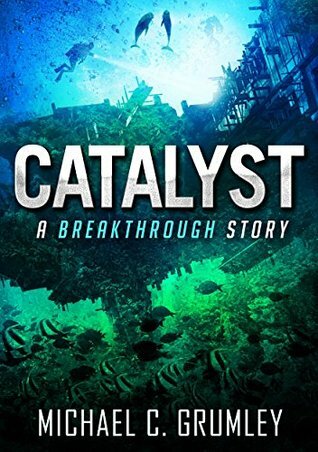 From South America to Africa, the USA and further afield, this book starts where Catalyst left off and doesn’t stop until the last page. Even then, you’re left hanging. On one level, I was so disappointed I finished as I wanted to continue to immerse myself in the life and death adventures of this intrepid group and the animals with whom they’ve learned to communicate and for whom you end up caring as deeply as they do. On the other, I was so excited to read Grumley is continuing with the series. What surprises – no, shocks me – most of all about this series is that Grumley is self-published. The quality of his work, of the prose, the editing, is testimony to how seriously Grumley not only takes his craft but respects his readers…. Allow me to digress a moment. As a reviewer (and writer) of books, I get sent many self-published books and books from established publishers to read and consider. With the professionally contracted and published books from known publishers, you can usually rely on, if not always a story that grabs you, at least the excellence of the grammar and syntax. With self-published books, in my now long experience, not so much. There are times I cannot even read beyond a few pages of a self-published book – albeit by someone who has gone to the trouble of hiring a professional PR person to spruik it for them – because of spelling and other errors littering the book. I even had one that changed characters’ names halfway through and clearly forgot – truly. Needlesstosay, I do not review those books. I don’t think it’s fair on anyone to criticise something that someone has sunk not only their heart into, but also paid a number of people to print, package and distribute. I generally don’t negatively review books (I might, however, point out a weakness in an otherwise good book or critique an aspect) that have been professionally published either – ie. the author has been paid by a publishing house – for the same reason. Unless I have something mainly positive to say, I stand by my grandmother’s words – don’t say it. Sadly, there’s usually someone else out there that’s doing it anyhow… I just wish that self-published authors would pay a decent editor – someone with rungs on the ladder, references and proof of work and a grasp of the language as well. They do themselves and their stories (many of which would be very readable) a huge disservice by cutting that particular corner or relying on their own or a friend’s or family member’s abilities. Books need a few set of experienced, professional eyes on them to iron out the errors – and then some are missed – I speak from experience. Grumley and someone like Hugh Howey – who was originally self-published until he was picked up by a publishing house – are great examples of exactly what to do when putting your work out there under your own steam and money. Anyhow, now that’s off my chest, back to Grumley and the Breakthrough series. The excitement his tales generate is of a calibre that’s beyond many a well-known authors’ works in similar genres. How a major publisher has not picked this guy up and offered him a contract is astounding. The uniqueness and beauty of his stories, as well as the excitement they generate, never mind the compassion at its core deserves that at least. Then there are the many readers who clearly agree with me. The fourth book in the really exciting Breakthrough Series, Ripple keeps the pace fast, the plot tight and the action going. In this book, the specially formed group overseen by Admiral Langford and operating under the radar are dispersed across oceans and continents, trying to unravel secrets left beneath the waves eons ago, and searching for another source of the remarkable biological entity they earlier found and which the Chinese and Russians sought to possess at any cost. An entity which can change the course of humanity’s future while at the same time throwing the past into question. Once more, lives are in danger, the clock is ticking and as the group draw closer to the truth, the risks they take become even greater, the rewards if they succeed, do as well. This series is just such a great read. Michael C. Grumley can not only write but inviting you to suspend your disbelief and douse your cynic gene, he takes you on an emotional and visceral ride that is breath-taking in scope and richly imaginative. I am utterly stunned a major publisher has not picked this guy up, but I am so grateful he keeps writing and that his following is growing. Cannot wait to read the next instalment in this series and see where he takes us, never mind his characters. Catalyst by Michael C. Grumley. Another terrific instalment in what’s fast becoming one of my favourite action-adventure, techno-thriller series ever. Add to that a dose of science fiction and eminently readable prose, engaging characters and a terrific plot, and this is a recipe made in reader heaven. Commencing about two weeks after the events in book #2, Leap, Catalyst has the intrepid group determined to protect an amazing discovery – at any cost. But when other parties not only become involved but demonstrate the lengths they will go to ensure the prize is theirs, the group comprising of John Clay, Steve Cesare, Alison Shaw and her colleagues as well as Deanne, Dulce, Dirk and Sally begin to wonder if the sacrifices required are worth it. Nail-biting at times, with heart-warming (and breaking) moments, this is a wonderful read that has an OMG finish. Can’t recommend highly enough. I have downloaded book 4, but am saving it as I don’t want to finish this series too quickly!